This is a trailer for Within the Darkness. It was written by Jonathan Zuck and Cheryl Compton, Jonathan Zuck, and stars Tonya Kay (Criminal Minds), John C. Bailey (Clowns), Shanna Forrestall (The Last Exorcism), and Cheyenne Phillips (The Sandman). It will be released on VD on April 3rd. Check out the synopsis and trailer below. "A down on their luck group of friends with aspirations of fame and fortune in the ghost hunting business stumble upon the real deal. Shooting footage for the TV series "The Paranormal Dimension, with Austin Barnett," Austin (David Coyne), Lucy (Erin Cline), Jesse (Kay) and Bruce (Bailey) are not prepared for what awaits them in the Hewitt House. 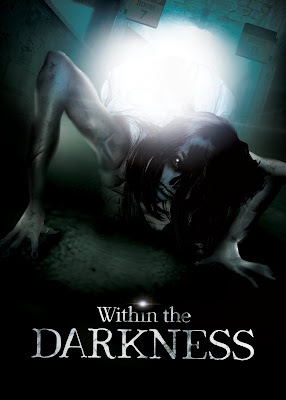 A long dead, evil spirit is more than happy to give them what they seek – the scare of a lifetime. Be careful what you wish for…"